Our gaming experts all agree on one thing - 2016 is going to be one hell of a year to be a gamer. But which platform is going to have the best year? We've given our PlayStation, Xbox, Nintendo and PC gaming experts a chance to make their case and explain why their device is going to be the dominant games machine of 2016. Today we're starting with what it means to be a PlayStation gamer in 2016. Perhaps we should have known all the way back at E3 2013, when the price and every detail about it was met with thunderous applause, that the PlayStation 4 was going to be astronomically successful. Back then we just thought it might have been because Microsoft had so royally stepped on gamer toes that anything which didn't force a Kinect on you or stop you playing games at friends' houses was a good idea. But here we are and the PS4 is just over two years old and there are now more than 35.9 million of Sony's matte parallelograms snug under televisions. In the Christmas season alone, 5.7 million PS4s were sold between November 22nd 2015 and January 3rd 2016. But sales are just numbers, not games and it's what's next for PS4 that counts and 2016 is going to be quite the year. First off is one lovely word: exclusives. Although it clearly didn't have an effect on sales, PS4 exclusives were somewhat thin on the ground in 2015. Things couldn't be more different this year. On January 28, the first console exclusive of the year hits in the shape of Braid developer Jonathan Blow's The Witness. Indie game royalty - the man made the wonderful Braid almost single handedly - Blow has been working on this beautiful puzzler since 2008 and the fact that it became a PS4 exclusive was quite the victory for Sony. We'll see what happens on release but as indie exclusives go, this is a massive win for us PlayStation gamers. Then there's the small matter of a certain half untucked adventurer. Nathan Drake's final outing in Uncharted 4: A Thief's End is not only the biggest exclusive of the year but one of the biggest games full stop. Sony development studio Naughty Dog is so intent on getting Drake's finale just right that the game has been delayed twice for extra work. In his last PlayStation Blog post creative director Neil Druckmann said that the game is "the most ambitious installment in the Uncharted series" and is "shaping up to the be the proper send off for Nathan Drake that we've promised you." Oh well, when you put it like that, we can definitely wait until April 26 to finish off the series. Uncharted 4 has all the hallmarks of being another exceptional Naughty Dog title, this time with dialogue trees(! ), a suitably insane multiplayer, and visuals so beautiful it makes The Last Of Us Remastered look positively last gen. In terms of other exclusives, there's the console exclusive Street Fighter V in February as well as Gravity Rush 2, Gran Turismo Sport, the long awaited Last Guardian and Dreams, the latest from Little Big Planet devs Media Molecule. There's also the not-to-be-missed No Man's Sky. 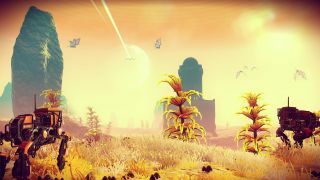 The much hyped - and for good reason - procedurally generated universe explorer from Hello Games will arrive on PS4 and PC in June this year. This is literally the biggest game of 2016 as it would take one player approximately five billion years to visit each and every planet in the expansive galaxy. And you thought Fallout 4 was overwhelming. Finally, if we try not to say it too loud, there's also Killzone dev Guerilla Games' robo-dinosaur packed Horizon Zero Dawn on PS4's exclusive slate, though a 2017 release window is perhaps more likely. While these exclusives alone could be excitement enough for the year ahead, PlayStation VR is just around the corner. The ex-Project Morpheus headset brings Sony into the future alongside PC big hitters Oculus Rift and Valve's HTC Vive. It's a good thing too. Virtual reality has the power to change the gaming landscape entirely and PlayStation VR can bring that to the mass market if it's priced keenly enough. Those 35.9 million consoles are all VR ready and that's an install base neither Oculus and Vive can boast of. Look at the PC specs required to run those headsets at the quality and speed they deserve and it suddenly becomes a very expensive upgrade as players purchase the headset and find they need a better graphics card. PlayStation VR on the other hand requires no upgrade and only has a processing box around about the size of the Wii. The headset isn't quite as powerful as the $599 Oculus Rift but does have a full 1080p LCD display and a 100 degree field of view. It also uses the PlayStation Move wands as replacement hands in game and the tracking works beautifully. Most importantly however, Sony has more than 200 developers signed up on the PlayStation VR program who are hard at work on more than 100 games. Reassuringly this means it's taking VR seriously and no-one will be buying a Sony headset that doesn't have any games. Currently triple A developers are hanging back on announcing massive titles for virtual reality but Ubisoft has announced a flying Eagle sim and, more excitingly, Crytek's Robinson: The Journey shows that bigger studios are getting on board with the potential that VR offers. There are currently more than 50 confirmed titles for PlayStation VR that includes a version of music sim Rez, Tekken 7, Driveclub, and a horror packed rollercoaster companion to Until Dawn called Rush Of Blood. PlayStation VR is still slated for a Q1 release so expect a price point sooner or later that might just reshape PlayStation gaming forever. Stepping back into the real world, Sony didn't delay when it came to hoovering up Metal Gear Solid auteur Hideo Kojima when his Konami contract ran out late last year. PlayStation's Andrew House gleefully announced a partnership with the development god and we've already seen Kojima visiting Sony's studios with PS4 architect Mark Cerny. The pair recently toured the company's VASG (Visual Arts Service Group) to show off the motion capture technology on offer. This might not seem much now but this is the groundwork for one of PS4's biggest future releases. Kojima's next project will mark an exceptionally exciting time for PlayStation. And this is just the start of the year. We have E3 to come in June where we'll presumably have a slew of new announcements. Naughty Dog's non-Uncharted team might have something new up their sleeves and by then we'll already have PlayStation VR on shelves. Whether we can expect triple A releases on virtual reality, we'll have to wait and see but it's going to be an exciting year ahead in terms of gaming. Add in Sony's relentless acquiring of PlayStation exclusives and early access to DLC for big names such as Call Of Duty and things will get even more interesting. There won't be a better time to be on Sony's team. Vive le PlayStation! The PS4 games you have to have played.